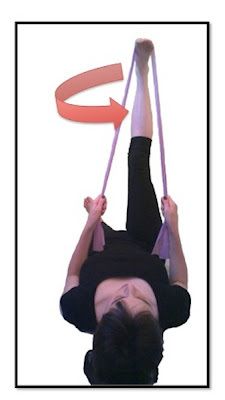 This exercise uses the theraband to assist with the leg circle, which in turn increases the hamstring stretch. This exercise increases the length in the back of the hamstrings and is what is called a dynamic stretch. Encouraging movement and length at the same time in any muscle will increase the length found and increase the chances of maintaining the length once the exercise is finished.